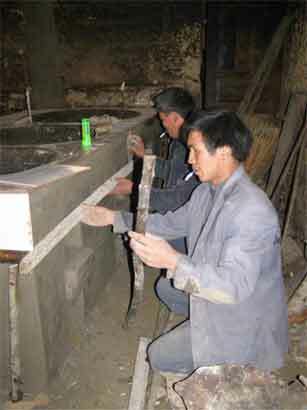 DORS provides training direct to villagers as part of the projects. For example, with the water supply projects we provide training in mangement and maintenance. With forestry projects, we arrange training sessions for selected villagers. We also conduct broader training on village management of development projects, and livestock development as needed. DORS also provides study tours for local staff of NGOs and government departments to visit our projects and exchange experiences. In the past we have had visits from various organisations including Ausaid, WWF, Trace Foundation. We also provide short term placements for staff of other organisations to learn about DORS participatory approach. From DORS’ 1996 registration as a charity until March 2007, we implemented more than 80 trainings, 418,341 yuan of funds have been put to use, and through the support of the British Embassy, Canadian Civil Society, Methodist Relief and Development Fund (MRDF), Partners for Community Development (PCD) and other organizations’ support, altogether 550 people have been trained (including villagers, cadres, and young people from in and outside of China). Project Aim: Through creating and increasing training and study opportunities, we have increased villagers’ and their leaders’ project management ability; through supporting and training young people interested in development work, we give them practice in this field. The trainings we do are of three large types: First, project management training—such as participatory methods training; second, professional technical training—such as fuel-efficient stoves construction training, forestry training, water and electricity projects technical training, etc. The third type is young people’s training—such as cooperation with many other NGOs in Sichuan to participate in the Sichuan Youth Volunteer Program, which gives many youth the opportunity every year to work in an NGO and gain experience. The earliest training DORS did was started in April of 1998. At that time, in DORS project village Shashu, we implemented an electricity project using 15 small water-powered generators. In order to let villagers use them, manage and maintain them, DORS invited the Rural Machinery Bureau’s teachnical engineer to train 4 villagers in electrical knowledge, for example: how to most effectively use, examine and fix the generators. The goal was for the villagers to master the theory and be able to complete related tasks independently. We used a process of theoretical training mixed with hands-on practice: for example, the engineer would take apart the machine, and use the parts of it as visuals to teach the trainees related knowledge. This way villagers can master things quickly. October 2001, after DORS had done several years of water projects, we did a summary, and found that villagers not being able to effectively maintain the project was due to lack of expert technical and management methods. Therefore, DORS organized a series of “Sustainable Water Supply Management” trainings, with the support of the British Embassy Small Grants Scheme. The aim of the project was to protect the sustainablility of the water system, through training and aiding villagers. The focus is establishing and maintaining local sustainable development ability. Through these practice-sessions the communities can design management systems suited to local conditions and find appropriate management methods. For example, if a place’s water resources are lacking, villagers can discuss together how to solve this problem. Or if the water taps are not well managed, how to assign fines, etc. Since encouraging villagers to discuss different questions, brings up different answers from different people, it helps the people feel the system is their own, and it makes the whole atmosphere of the training more exciting. At the same time as the management training, we also arrange to improve health conditions through safe drinking water study activities. This activity was organized together with the Hanyuan Sanitation Bureau’s Epidemic Prevention department and students Patricia Lee and Kevin Kwan of the Medical Institute of University of Western Ontario in Canada, and contents were based on villagers’ living conditions, for example: individual sanitation, before using water for drinking first run the tap for a while, how to avoid pesticide poisoning, use different towels, and women’s and children’s health, etc. 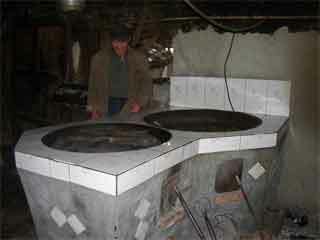 Starting from October 2000, DORS started to implement fuel-efficient stoves projects in our project villages. 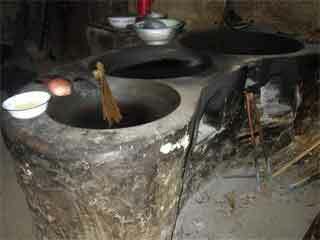 For a detailed introduction to this project please see Rural Energy Projects—Fuel-Efficient Stoves. 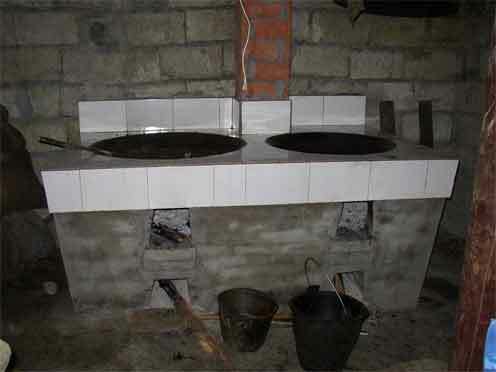 In this project we experimented with training villagers in the technology of building fuel-efficient stoves. Up to May 2008, through combining theoretical training and on-the-job practice, we have trained 59 village level technicians. We achieved the original aim—sustainable projects and solving the problems of the vllagers themselves. At the same time through studying new technology and improving skills, they gave themselves the ability to go out and earn money building stoves. In this project, we encourage villagers to be creative in the use of their new skills, after mastering the basics, and for examples see the captions to the following photos. As 2001 started, DORS implemented several large-scale comprehensive trainings. DORS first did a series of capacity-building trainings in Fulin town of Hanyuan County. The training included participatory methods training, project management training, internet training, etc., while also giving practical experience to young development workers. In 2004-2005 we held a further two comprehensive forestry trainings. All different village’s representatives gathered together, and besides studying themselves and gathering knowledge from experts, everyone had the opportunity to share information on conditions in different villages, in lively chatter. All the villager representatives that attended believed this training was interesting and very informative, the majority also saying they had never attended a training that was this participatory. This is Development Organization of Rural Sichuan’s long-term goal, to support and strengthen local groups using their own strength to implement development projects. 1. Villagers added to their understanding of and familiarity with DORS’ working ideas and methods, and put participatory methods to use in practical work. For example: listening. Before, once the majority of people agreed to a thing, it was decided, and the minority was no longer listened to; but now, the villagers feel listening to other opinions is also very important, therefore they now take special time to understand and communicate more, not just deciding or the leaders deciding. 2. New opportunities have been created for villagers to come in contact with new learning methods, and get to know other people’s thoughts. After attending training, some villagers are most inspired, for example: their own management of trees is very good, and they are proud of it, and at the same time they are eager to share what they know with other villages’ residents. 3. While studying new knowledge, they find ways to resolve their own difficulties. For example: After attending a project development and management training class, Chenhe Village’s women’s cadre Chen Guixiu told us she is more brave in speaking up than before, and confident. After returning home, she organized six women together and applied to DORS and the Animal Husbandry Bureau for funds for a breeding bull as a development strategy.